This article reviews the literary representation of the Dothraki culture in George R.R. Martins A Song of Ice and Fire as well the visual portrayal of the Dothraki in HBO’s Game of Thrones in comparison with the historical Huns and Mongols. The initial focus of the article will be to define the context of each culture in order to define specific cultural identifiers for later examination. The summaries look specifically at the portrayal of both the Hun and Mongol cultures in relation to foreign perspective as well as look at the expansion of each culture in relation to one another. Following the analysis of the Huns and Mongols the article will then examines the development of the Dothraki culture in terms of the literature of George R.R. Martins A Song of Ice and Fire as well as other literary sources in order to examine the past culture of the Dothraki people. In addition particular attention will be paid to the visual representation of the Dothraki culture in the HBO Game of Thrones series and the influences of Native American, African and Afghani cultures in relation to architecture and costume design and the implications this has on the connections with the Huns and Mongols. Finally this article makes a comparative analysis of the Dothraki culture with that of the Hun and Mongol cultures and specifically identifies the figures Attila the Hun with that of Khal Drogo as well as the figure of Genghis Khan with that of the Dothraki’s Great Khal. George R.R. Martin’s A Song of Ice and Fire portrays a variety of cultures and religions within his world. These fictional cultures and religions each have similarities to real world cultures and can often be associated with either a single culture or a multitude of cultures that span over a variety of time periods. One of the key cultures that we are introduced to in the beginning of the novels as well as during the first episode of the HBO’s Game of Thrones series is the Dothraki, a nomadic horse-riding people which bears a striking resemblance to the history of both the Huns and the Mongols. This essay will examine the history and major historical figures during the time of the Hun’s and Mongols and compare them to the Dothraki culture that we witness in George R.R. Martins A Song of Ice and Fire and HBO’s Game of Thrones. The Huns were a nomadic group from Central Asia who began raiding the Roman Empire around 358 AD. The Huns occupied territories of Central Asia, the Caucasus and Eastern Europe though they were never know to settle down. They were a constantly moving people who did not establish kingdoms, empires or open trade routes. The Huns were defined as a barbarian culture and their name is commonly utilized as a synonym for barbarism. The Huns reputation of destruction and murder named them the barbarian nations that other barbarians were afraid of. Known for their ability to use archery while on horseback with deadly precision the Huns were a fearsome enemy. Due to the Huns skills in horseback and archery the Huns were sometimes associated with Centaurs. While the Roman Empire was set upon by dozens of Hun chieftains and kings the height of the Huns power was centralized during the reign of Attila the Hun, or otherwise known as the Scourge of God. Attila came into power alongside his brother Bleda and both shared the territories and right to rule until Bleda’s death in 445. From that point on Attila led the Huns on a brutal rampage of the Eastern Roman Empire and left complete destruction in their wake. Known for his brutal treatment of deserter’s betrayers sometimes in the form of crucifixion or impalement those under threat of Attila’s temper were quick to make payments and offer tribute to avoid punishment. During Attila’s reign he made several demands of the Roman Empire including doubling the gold payment, deny asylum to Hun deserters, free trade with Margus and no alliance with Hunnic enemies. The Hun’s many defeats over the Roman Empire helped to establish their reputation however, their lack of desire to settle and build long-lasting empires and cities made them an oddity in the eyes foreigners. The Mongols were the ethnic group deriving from Mongolia as well as other surrounding areas, the Mongols established an empire during the 13th and 14th centuries under the rule of Genghis Khan. During his rule Genghis Khan conquered 30 countries, the following map illustrates the expanse of the Mongol Empire. The full extent of his empire was approximately eleven and twelve million square miles. The Mongols like the Huns were a horseback riding culture with a brutal reputation. A large majority of the sources depict the Mongols are equated to monsters and often labelled as human monsters. The depictions of the Mongol culture from surrounding sources comment on their sadistic nature such as their thrill of watching their young children beat to kill another child. Similar to the Huns the Mongols found their greatest success under the rule of a single man Genghis Khan who claimed the rule over all nomadic nations in Mongolia. Genghis Khan’s empire consisted of areas in Asia, Russia and Eastern Europe. His original name was Temujin before he took on the name Genghis Khan which translates to “The Great Emperor”. Genghis Khan unlike Attila consolidated his power and quickly formed a vast and great empire, Weatherford describes Genghis Khans ability to create an empire as a form of architecture “architecture was not in stones, but in nations”. In George R.R. Martins A Song of Ice and Fire the Dothraki are a nomadic people that occupy what is termed as the Dothraki Sea, a large expanse of Grasslands in the Essos. Travelers deem the area as the Haunted Lands or The Great Desolation for the ruined cities that occupy the area, one of the cities in question is the Kingdom of Sarnar. The following interactive map allows for a more in-depth look at the areas of Westeros and Essos. The Dothraki in George R.R. Martin’s world represent a powerful and nomadic people. Not truly united the Dothraki maintain their position and power over the grasslands and collect payment from neighbouring cities in order to ensure protection. One of the key concerns for the people of Westeros is the fear that while the Dothraki may not wish to cross the narrow sea because of their cultural beliefs if they were to the results would be devastating, this is evident in the series during Robert Baretheon’s discussion with Cersei. The portrayal of the Dothraki within HBO’s Game of Thrones adaptation took inspiration from a variety of cultures in the costume and depiction of Vaes Dothrak. Jackson took inspiration from cultures in the Pacific Islands and looked at the temporary shelters used by nomadic indigenous groups in order to gage what type of architecture the Dothraki would have used. Inspirations from Native American, African and Afghani influences were used to the Dothraki clothes with a key theme of natural elements. The stress on natural colours and textures were used in order to distinguish the Dothraki culture and some color was used in small areas such as the blue pigment used in the wedding scene. The writers of the show go one step further in the representation of the Dothraki and use linguist David Peterson to create the language for the Dothraki. Unlike the novels the show utilizes linguist Peterson to create a distinct cultural identifier in the terms of the Dothraki people where as in the novels we are simply treated to statements that reveal the Dothraki speak in a different dialogue. The following behind the scenes video follows the reasoning and challenges concerning the adaptation of the Dothraki Language. Peterson notes that in developing the Dothraki language he utilized the some 30 phrases already present in George R.R. Martin’s novels and continued to form a basis for the language through an analysis of what the past Dothraki culture would have been. HBO has even launched a new app called Dothraki Companion with the intention to allow fans to connect with the series in a more personal way. The following video illustrates the full use and background information regarding the Dothraki Companion app. The use of intricate costumes as well as the creation of the Dothraki illustrates a very distinct culture within the Game of Thrones world and while the Dothraki draws on elements of indigenous and African influences in their physical representation there are strong comparisons both culturally and politically to the Huns and Mongols. The Huns and Mongols bear striking resemblances to the Dothraki people with regards to perception, culture, geography, as well as politics.The very first instance where were are introduced to the Dothraki culture in HBO’s Game of Thrones is through the perception of Viserys who continually calls the people savages and barbarians. This perception of the Dothraki as barbaric savages from the views of foreign cultures is a typical situation that is encountered when discussing the Huns and Mongols. The culture of the Dothraki is extremely similar to that of the Huns and the figure of Khal Drogo is a very similar representation of Attila the Hun. Described as a fearsome and brutal warrior Attila unites the Huns tribes but does not establish any permanent Empire. Drogo’s only attempt to seize power comes after the life of his wife Daenerys Targaryen is threatened. The following two scenes from HBO’s Game of Thrones depict Khal Drogos resistance to aid in Daenerys quest for the Iron Throne and his subsequent change in opinion after Daenerys life is threatened. While the culture of the Dothraki emanates largely from the Hun culture the geographical and political aspects of the Dothraki culture are heavily influence by the Mongolian people. The Dothraki culture understands the Dothraki Sea as the extent of their world, they find it hard to contemplate that there is another land mass across the narrow sea. This is evidently seen when Deanery’s attempts to convince Drogo to help her take back the Iron Throne in which he muses that a King does not need a throne only a horse. The Dothraki refuse to cross the narrow sea and as such are limited in their power. The Mongols like the Dothraki never crossed the sea and greatly hindered their ability to expand their empire. In the Dothraki culture there is a general belief that all the khalasars will unite and gather at Vaes Dothrak for the great Khal, also known as the stallion who mounts the world. The figure of the Great Khal can be represented as the Mongolian leader Genghis Khan whose literal translation means the great emperor. Some may argue that the Great Khal can also be seen in the figure of Attila the Hun who like Genghis also united the nomadic Hun hordes the figure of Attila can be more accurately represented by Khal Drogo who unites several Khalasars but does not unite them all. Genghis Khan on the other hand established fierce and powerful army whilst also uniting the Mongolian hordes. Therefore accomplishments of Genghis Khan and his Mongolian Empire more accurately depicts the goals and vision of the Dothraki culture as they are united under the Great Khal while the accomplishments of Attila is a more accurate representation of the Dothraki as united under Khal Drogo. George R.R. Martin’s A Song of Ice and Fire draws heavily from past societies for the inspiration of the different cultures that appear in his stories. The Dothraki are seen as a barbaric and savage society from the views of foreign cultures similarly to how both the Huns and the Mongols were portrayed as monsters. Elements from both the Mongols and the Huns can be seen in the portrayal and history of the Dothraki culture despite the fact that the visual representation of the culture in HBO’s Game of Thrones draws heavily on Native American, African and Afghani cultures and histories for the architecture and costume design. Figures like Attila the Hun and Genghis Khan are represented in the figures of Khal Drogo as well as the Great Khal portrayed in Dothraki Legend. Despite these similarities we cannot identify the Dothraki as one or the other but rather a mixture of both cultures. Adair, Jamie. 2014. History Behind Game of Thrones: Attila the Hun Part 2. May 14. Accessed April 3, 2015. http://history-behind-game-of-thrones.com/ancienthistory/attila-the-hun-part-2. Cogman, Bryan. 2012. Inside HBO’s Game of Thrones. San Francisco: Chronicle Books LLC. Craughwell, Thomas J. 2008. How the Barbarian Invasions Shaped the Modern World: The Vikings, Vandals, HUns, Mongols, Goths and Tartars who Razed the Old World and Formed the New World. Massachusetts: Fair Winds Press. Dredge, Stuart. 2014. 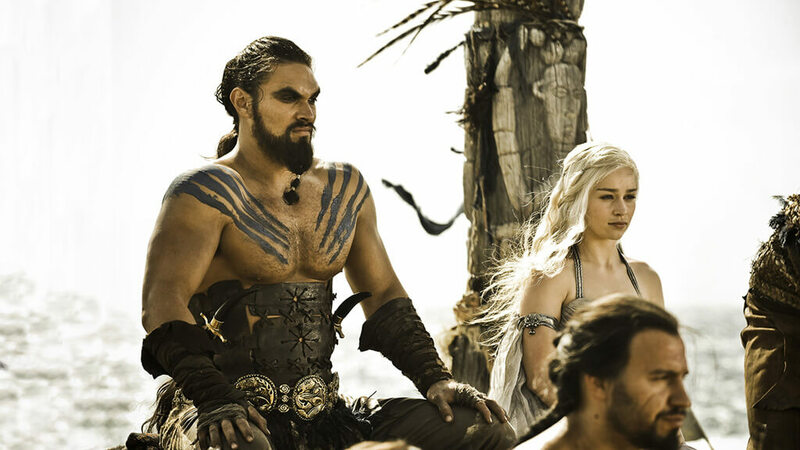 “Game of Thrones spawns an app to help fans learn to speak Dothraki.” The Guardian. October 14. Accessed April 3, 2015. http://www.theguardian.com/technology/2014/oct/14/game-of-thrones-app-dothraki. Giffney, Noreen. 2012. “Monstrous Mongols.” Postmedieval: A Journal of Medieval Cultural Studies 227-245. Lindner , Rudi Paul. 1981. “Nomadism, Horses and Huns.” Past & Present 3-19. Martin, George R.R. 1996-Present. A Song of Ice and Fire. New York: Bantam Books. —. 1996. Game of Thrones. New York: Bantam Books. Martin, George R.R., Elio Garcia, and Linda Antonsson. 2014. The World of Ice and Fire: The Untold History of Westeros. New York: Bantam Books. Rastogi, Nina . 2011. “Is “Game of Thrones” Racist?” Slate. April 20. Accessed April 4, 2015. http://www.slate.com/blogs/browbeat/2011/04/20/is_game_of_thrones_racist.html. “Recap: Language creator David Peterson on ‘The Next List’.” CNN. April 9. Accessed April 3, 2015. http://www.cnn.com/2012/04/09/tech/recap-language-creator-david-peterson-on-the-next-list/index.html. Taylor, Cat A. November 11, 2014. Inside HBO Game of Thrones Seasons 3 & 4. San Francisco: Chronicle Books LLC. Thomas J. Craughwell. 2008, 36. Thomas J. Craughwell. 2008, 41. Rudi Paul Lindner “Nomadism, Horses and Huns.” Past & Present (1981): 3. Thomas J. Craughwell. 2008, 50. Jamie, Adair. 2014. History Behind Game of Thrones: Attila the Hun Part 2. May 14. Accessed April 3, 2015. http://history-behind-game-of-thrones.com/ancienthistory/attila-the-hun-part-2. Thomas J. Craughwell. 2008, 260. Noreen, Giffney. “Monstrous Mongols.” Postmedieval: A Journal of Medieval Cultural Studies (2012. ): 233. Bryan Cogman. Inside HBO’s Game of Thrones. 2012. (San Francisco: Chronicle Books LLC.) 146. George R.R. Martin, Elio Garcia, et al. 2014 923. 2012. “Recap: Language creator David Peterson on ‘The Next List’.” CNN. April 9. Accessed April 3, 2015. http://www.cnn.com/2012/04/09/tech/recap-language-creator-david-peterson-on-the-next-list/index.html. George R.R. Martin, Elio Garcia, et al. 2014 293. George R.R. Martin, Elio Garcia, et al. 2014 291. Cat A. Taylor. Inside HBO Game of Thrones Seasons 3 & 4. November 11, 2014. (San Francisco: Chronicle Books LLC. ): 68. Thomas J. Craughwell. 2008, 262. Thomas J. Craughwell. 2008, 265. A Rose by any Other Name – Which Westerosi War is the Wars of the Roses?